Chris Ware is a storyteller known for his book Building Stories. Ira Glass is the creator and producer of the radio program This American Life. Françoise Mouly is the publisher of TOON Books and the art editor of The New Yorker. Art Spiegelman is the Pulitzer Prize–winning author of Maus. "The great cartoon artist . . . tells the story of his life in comic form, accompanied by family photographs, New Yorker covers, his toylike wood sculpture, and the wonderful dollhouse-like models he builds of some of his characters’ homes. There’s also a class syllabus full of self-deprecating asides and useful artistic advice . . . Mr. Ware has always written as well as he draws, especially here, when he knows his subject well." " 'Monograph,' the obsessive autobiographical chronicle of the life and work of the cartoonist Chris Ware, is not for the faint of heart. It is dense with comics, photographs, mementos and recollections of the artist. Savor the New Yorker cover section near the end." "The size of a large roasting pan, Ware’s latest whopping collection (after “Building Stories,” 2012) is a chronological tour of the singular cartoonist’s life and work. “Jimmy Corrigan: The Smartest Kid on Earth” and plenty of other panels of his instantly recognizable, stylized characters share space with New Yorker covers, photos, paintings, sculptures and notes. Completists and neophytes alike will get lost in it all — happily so." 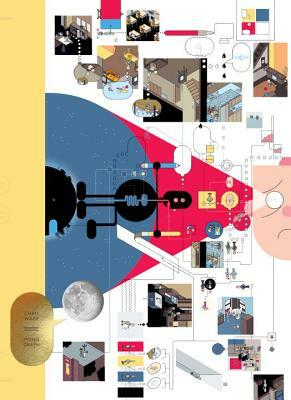 "The new Chris Ware book has sat beside my desk for weeks. It’s been tough to miss. It’s about a foot-and-a-half tall with a canary-yellow spine, and the cover image is signature Ware: Comic book hieroglyphics of domestic ennui, linked by thin schematic lines, flow charts of word balloons and worried portraits of the Oak Park genius himself." "Just the other day, I received the ultimate opus, Chris Ware: Monograph (Rizzoli), and tore through it knowing that this extra tall, super heavy, inspiringly printed volume (with a few surprisingly tipped in comic book gems) was going to take up a lot of my free time." "The noted artist, collector, and visionary offers a personal anthology/memoir, complete with junior high photos and memories of the cul-de-sacs of Omaha. “Does the world really need another printed tome about an artist, let alone one about an admittedly marginal and rather questionable graphic novelist/artist/writer who has already littered the recycling centers and used bookstores of his home country with dog-eared examples of his own self-regard?” So asks Ware (Building Stories, 2012, etc. ), deep into a collection whose Greek-derived and “somewhat self-referential” title speaks to his usual custom: writing alone, tucked away in a dark corner with pens and books. NPR host Ira Glass, who provides the preface, got him out of the house a few years ago, Ware writes, and the exposure helped him become better known to readers, but it wasn’t as if he was a hermit. He worked as a newspaper cartoonist, a graphic artist, an illustrator, and, as he writes, learned on the job to be a social being and to pay attention to deadlines and requirements, all good things for a budding artist to know. Throughout, Ware peppers his narrative with other lessons he’s learned along the way: about technique, the history of art, the links between cartoons and cinema, and yes, about life, aging, and so forth; it’s good to change your horizons and see the world, as he reckons, because “artists don’t develop in a vacuum.” The oversized book is overstuffed with art, each page spread containing numerous images, cartoon strips, sketches, mockups, snapshots, scrapbook items, and other such treasures that will be of immense appeal to fans of Krazy Kat and Joseph Cornell alike. The text is as smart and illuminating as the images, and Ware has wise things to say everywhere along the way. This collection has a last-word feel to it, offering a delightful summation of a fruitful and very busy last few decades. Fans, of course, will want much more, but this makes a great start. "Monograph is a coffee-table comic book featuring a mixture of Mr Ware’s life’s work, from his most recognisable characters Quimby the Mouse and Jimmy Corrigan the Smartest Boy In the World, to iconic New Yorker covers, as well as some never-before-seen sketches from the beginnings of his career, and biographical elements in the form of photographs from the artist’s childhood." "Monograph affords this deeper, tactile, and concentrated engagement with Ware. His willingness to confront his own memory and his past self is a treat to decipher, page after page, image after image. […] Monograph lets us behind the curtain of that fiction to watch Ware gather the pieces, take them apart, and reassemble them."